The hull and deck of the Rob Macks-designed kayak are western red cedar with aspen accent strips. The coamings are made of laminated ash. Both deck and hull are covered inside and out with fiberglass cloth and epoxy. 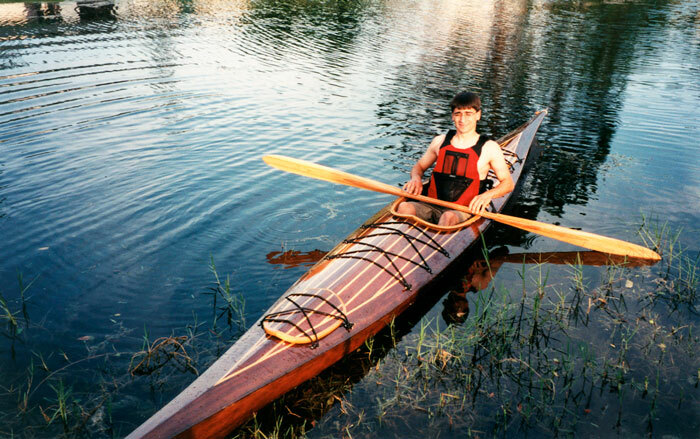 Steve Henderson finished the construction of the kayak but writes that it was started by Shawn Dubois who was living near Laughing Loon Canoes in Greenfield, MA at the time. In the summer of 1999, he moved to Kansas City, and took the partly finished hull with him. Steve bought the hull from Shawn, finished it up, and gave it to his daughter and her husband, Alfred and Lisa Perreca, Jr, as a wedding present. The kayak is 18'4" LOA with an 22" beam. It was launched on June 18, 1999 in West Palm Beach, Fl by the newlywed couple. Steve can be reached at sdhender@sbcglobal.net.